Derby put their poor recent form behind them by hammering already-relegated Blackpool to stay firmly in the race for promotion from the Championship. The Rams, who had only won one of their last nine, led in the third minute through Craig Bryson's strike. And they sealed the win before half-time through Tom Ince's driven goal and Darren Bent's curling finish. Bent added his second from the penalty spot after Ryan Shotton was pulled back in the box. With three games to go and a seven-point gap between the Rams and second place a late push for automatic promotion is highly unlikely. But this win does strengthen their position in the play-offs, leaving them fifth, four points ahead of seventh-placed Brentford, who lost 1-0 at Sheffield Wednesday on Tuesday. Blackpool are now guaranteed to finish bottom of the table and appear broken by a turbulent season, but Derby were still ruthlessly efficient in picking them off. Bryson was given acres of space but still had to pull out a precise and powerful shot to score the opener. Ince was not tracked but his curling finish to double the lead against his former club was still of the highest quality. Bent benefitted from an under-hit Charles Dunne back-pass for the third and his finish was emphatic. With the game won, Derby were able to ease off, although they still managed to add a fourth when Peter Clarke dragged back the charging Shotton and Bent fired home from the spot for his 12th goal in 15 matches since joining on loan from Aston Villa. Derby boss Steve McClaren: "This was the genuine article. We kept a clean sheet, we worked, we passed and moved, we played at a good tempo and we got our reward." Blackpool manager Lee Clark: "We need to change everything and restructure the whole club. This will mean a very busy summer but we have already started talking about players and I have never been knocked back whenever I have asked for support in bringing people in." 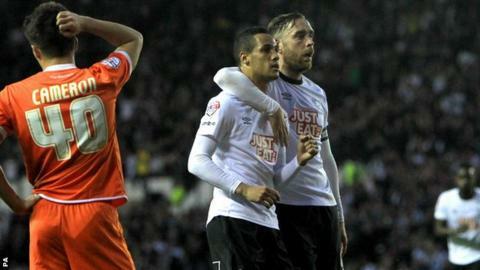 Match ends, Derby County 4, Blackpool 0. Second Half ends, Derby County 4, Blackpool 0. Attempt missed. José Cubero (Blackpool) header from the right side of the box is just a bit too high. Assisted by Andrea Orlandi following a set piece situation. Delay in match Jamie O'Hara (Blackpool) because of an injury. Jamie O'Hara (Blackpool) wins a free kick in the attacking half. Corner, Derby County. Conceded by Andrea Orlandi. Bright Samuel (Blackpool) wins a free kick on the right wing. Attempt missed. Jesse Lingard (Derby County) right footed shot from outside the box is high and wide to the right. Assisted by Stephen Warnock following a set piece situation. Foul by José Cubero (Blackpool). Kwame Thomas (Derby County) wins a free kick on the right wing. Foul by Darren O'Dea (Blackpool). Attempt missed. Jesse Lingard (Derby County) right footed shot from the centre of the box is too high. Attempt blocked. Charles Dunne (Blackpool) left footed shot from outside the box is blocked. Substitution, Derby County. Kwame Thomas replaces Jeff Hendrick. Jamie Ward (Derby County) wins a free kick in the defensive half. Attempt missed. Andrea Orlandi (Blackpool) left footed shot from outside the box is too high. Assisted by Jamie O'Hara following a set piece situation. Tom Barkhuizen (Blackpool) wins a free kick in the attacking half. Substitution, Derby County. Jamie Ward replaces Tom Ince. Corner, Blackpool. Conceded by Zak Whitbread. Offside, Blackpool. Charles Dunne tries a through ball, but Gary Madine is caught offside. Substitution, Blackpool. Bright Samuel replaces Henry Cameron. Substitution, Derby County. Johnny Russell replaces Darren Bent. Offside, Derby County. Jeff Hendrick tries a through ball, but Jesse Lingard is caught offside. Corner, Derby County. Conceded by Peter Clarke. Attempt blocked. Darren Bent (Derby County) right footed shot from the centre of the box is blocked. Assisted by Tom Ince with a through ball. Goal! Derby County 4, Blackpool 0. Darren Bent (Derby County) converts the penalty with a right footed shot to the top left corner. Penalty Derby County. Ryan Shotton draws a foul in the penalty area. Penalty conceded by Andrea Orlandi (Blackpool) after a foul in the penalty area.